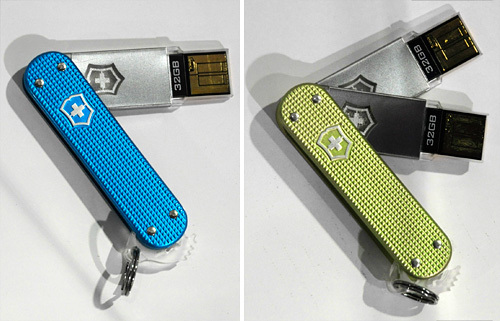 Victorinox's New Slim & Slim Duo Flight-Friendly Flash Drives | OhGizmo! As a tech blogger I keep an open mind about new gadgets, but at the same time, I still have my favorites. And when it comes to USB flash drives, for the past few years I’ve only been using Victorinox’s (aka the people who made the original Swiss army knife) offerings for my important stuff. At CES this year the company introduced a handful of new models including these Slim & Slim Duo drives which are lacking the traditional knife blade so that they’re safe to bring on a plane when traveling. In fact I’ve yet to have agents even bat an eye at them when passing through airport security. Available in 32GB size capacities, or 64GB with the Duo which simply doubles the number of flash drives, the Slims are not only some of the largest compact flash drives available, but also some of the fastest. What I like most though is that Victorinox doesn’t skimp on the components. Even the 32GB model is one of the fastest flash drives I’ve ever used when it comes to writing data. And the fact that they’re also waterproof and shock-resistant makes them a durable travel companion. But would you expect any less from the people behind the Swiss army knife? The Slims even come in a choice of 5 different colored housings including green, blue, orange, pink and silver. Pricing and availability TBA. Oh wow, this is nice. The fact that USB drives hold your very important data, it must be secured and Victorinox does it better than anyone else with this model. What I like with it is, it is water proofed.